Zethu Maseko and Esme Blair, Warmed to You, 2017, video still © Zethu Maseko and Esme Blair. Social Creative Network and Shadow Sistxrs Fight Club collaborated to co-produce the Self-Protection Manifesto, a collection of creative, experimental, visual and text responses to an open call for work on self-protection, self-love and self-care. The Manifesto expresses how young people navigate adversity, from their own perspectives. Join us for a showcase of film and performance celebrating self-care and protection to launch the Manifesto. Hosted by Shadow Sistxrs Fight Club’s Ayesha Tan Jones, a series of short films selected by a youth panel from the Social Creative Network is followed by live performances by artists Liv Wynter, Annabelle Sami, Katayoun Jalili and Kai-Isaiah Jamal. A limited edition of the Manifesto will be available at the launch and will also be published online. The showcase is followed by an intimate ritual and a screening of longer film works. Tan Jones will lead a low-key herbal tea ceremony with body movement therapy to electronic soundscapes from Shadow Sistxrs Fight Club resident DJ LC. All are welcome but spaces are limited; first come first served. The Social Creative Network is a digital project connecting young people with the Institute of Contemporary Arts. Curated exclusively by and for young people, the Network is designed to enable those who believe in the power of the arts and creative industries to make positive change in the world. 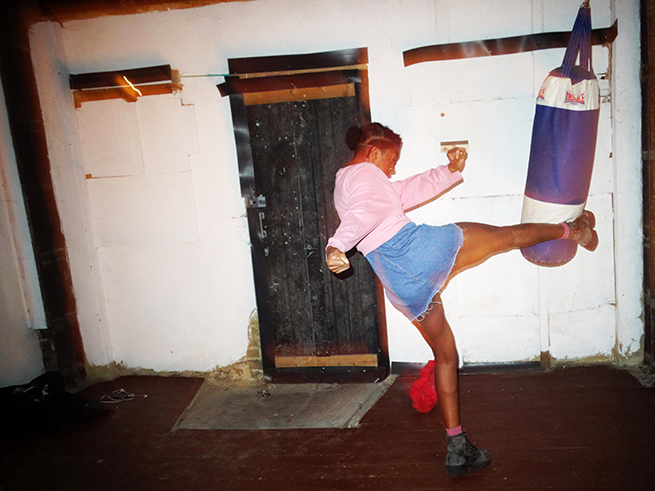 Shadow Sistxrs Fight Club was co-founded by Ayesha Tan Jones and Monique Etienne as a physical and metaphysical self-defence class for women, nonbinary people and QTIPoC witches. Combining Brazilian jujitsu with medicinal and magical herbalism, Shadow Sistxrs meditate on craft, culture and collective bodies as a radical and holistic approach to healing. Liv Wynter (Surrey, 1992) is an artist, educator, activist and writer from South London. They graduated from BA Fine Art at Goldsmiths in 2015 and have since become a notable voice within the political art scene. They recently resigned from their position as Artist in Residence at Tate Britain and Tate Modern on the Education Programme for 2017–18 to highlight the invisible inequalities of the institution. They are one of the selected artists for Art Night 2018 and are working on a feminist community project at FACT, Liverpool. They were Artist Facilitator with Indigo Youth at Hackney Museum, August 2017 – March 2018. They recently led a group show at David Roberts Art Foundation (May–July 2017), and in 2016, completed an Arts Council funded residency at The Royal Standard, Liverpool. They are a founding member of WHEREISANAMENDIETA and stand in solidarity with Sisters Uncut, London Anti Raids Network, Action for Trans Health, Antifa and any other grassroots organisation fighting austerity and oppression. They are also in feminist punk band Militant Girlfriend. Annabelle Sami is a writer, performer and comedian based in London. She has performed her work at Edinburgh Festival Fringe, Rich Mix, Backyard Comedy Club, Camden People's Theatre, among other London variety nights. She is represented as a children’s author by Andlyn agency. Katy Jalili (Katayoun Jalilipour) is a genderqueer, Iranian-born multidisciplinary artist, performer and writer. Katy has previously written for Shades of Noir (2016–17) and now writes freelance. They graduated from Performance: Design and Practice at Central Saint Martins in 2017 (First Class Honours) with research focusing on how queer femme bodies claim a performance stage. They are currently continuing their research on queer ancestry for people of diaspora, which led to the making of their first short film #Familiar #Touch #Lost #Figures, screened nationally and internationally. Kai-Isaiah Jamal is a spoken word poet/performer who tackles social matters through dialogue. Using talks, poetry and open conversation, Kai-Isaiah attempts to deconstruct gender stereotypes and moulds that exist within and without POC communities, with a particular focus on hyper-masculinity and vulnerability. As a TPOC, Kai-Isaiah's emphasis is on self-exploration and the trials and triumphs trans folk face and feel. Hoping to increase visibility for trans folk of colour, Kai-Isaiah speaks the unspoken and represents the unrepresented. Shadow Sistxrs Fight Club are Social Creative Network’s first artists-in-residence. In September and following the launch of the Self-Protection Manifesto, Shadow Sistxrs will run a series of self-defence classes at the ICA.